Bees and honey producers are thriving across parts of Scotland thanks to a helping hand from one of the nation’s most iconic birds – the red grouse. Despite long held concerns over a decline in the number of bees across the country, rural estates are reporting a proliferation in bees present on moorland as they access Scotland’s iconic heather. Heather moorland is most prominent on grouse managed moorland, where heather is a central part of the red grouse’s diet. Around 75% of the world’s heather is in the UK, with the majority of that on moors in Scotland. Across estates in Tayside and Angus Glens, beekeepers are positioning their hives on estates – in partnership with estate owners and gamekeepers – to increase the production of heather honey, fast becoming a famed Scottish food product to rival the acclaimed manuka honey. And in the Lammermuir Hills, there is a buzz around many of the region’s sporting estates that have been hosting honeybees producing heather honey that is in international demand. On two of the region’s estates – Hopes Estate and Mayshiel Estate – hives are placed every August and September. The honeybees access the heather, producing a unique type of honey that contains three sugars instead of the standard two. At this time of year, the hives are moved from the estate in order for honey production to begin, which has already begun to hit shelves at home and abroad. Ian Elliott, head gamekeeper at Hopes Estate, and part of the Lammermuirs Moorland Group, said: “The moorland heather, which is maintained to the highest standard as part of the integrated management of the estate, is favoured by beekeepers due to its rotational renewal. The heather is burned in strips in accordance with the Muirburn Code, which leads to its regeneration and more vigourous flowering and pollination which is perfect for the honeybees to access. 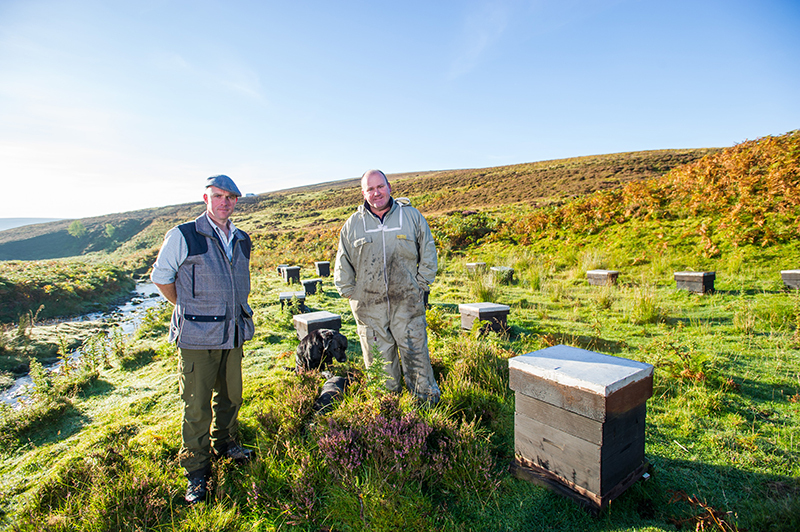 One of the businesses working with estates in the Lammermuir Hills is Hood’s Honey. For Stuart Hood, owner of Hood’s Honey, the partnership is vital to the success of his business.